If any of you experts see any problems with the math, please get in touch with us, we want this to be 100% correct. By now you should have memorized the speed of light in a free space ("c"), it's 2.9979E8 meters second, or about 186,000 miles per second, or as a rule of thumb, about one foot per nanosecond. This is the speed limit of the universe; no matter or information is allowed to travel faster. Correct answer: it depends on the medium! Note to Microwaves101 readers: most textbooks use the term "phase velocity" denoted by vp interchangeably to also mean "velocity of light in a medium". This gets confusing, so we will avoid doing it and denote "velocity of light in a medium" by vlight. Before we reveal this knowledge, let us point out that the lumped transmission line model now has its own page! In a media other than free space, light is slowed down, never sped up. We can define a velocity factor "VF" to account for this. The velocity factor will always be less than unity, remember that the speed of light in vacuum is the speed limit of the universe. Typically, coax vendors will quote a velocity factor for their wares. If the "stuffing" in a coax cable is PTFE, with a dielectric constant (relative permittivity) of 2.07, the velocity factor is 69.5%. 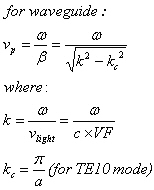 Velocity of light for quasi-TEM transmission lines such as microstrip and coplanar waveguide is equal to the speed of light divided by the square root of the effective relative permittivity. For a description of what is meant by effective relative permittivity, go here. Sometimes it is denoted as keff, sometimes re. Frequency doesn't change when a signal encounters material and transmission line effects, but wavelength does. The change in wavelength compared to free space is inversely proportional to velocity factor. The phase velocity is the speed at which a point of fixed phase propagates, which is not always the speed that electromagnetic information travels. In TEM waves, the phase velocity is the same as the velocity of light in the chosen medium. We like the more complicated form of the equation on the left, because it has been reduced to a function of velocity factor VF and cutoff wavenumber which relate to dimensions and material properties. Here you can see that the velocity factor has two effects: it directly reduces the phase velocity in the numerator, while its placement in the denominator acts to increase phase velocity. The form of the equation on the right, the velocity factor term in the denominator is built in to the cutoff frequency term fc. From this you can see that when the cutoff frequency is reached, the phase velocity goes to infinity. It can be seen that this implies that group velocity is less than the speed of light, while phase velocity is greater than the speed of light.